Sabrina and Jonathan’s outdoor Sarasota wedding featured a romantic color palette of gold, blush and white. The Tampa couple chose to host a Sarasota wedding to ensure that their northern wedding guests would experience the beaches and some nicer weather during the winter months. Searching for a Sarasota wedding planner with experience at their venue and also a sense of style, the bride and groom hired NK Productions. “I had a call with Nicole of NK Productions and knew she would be perfect; she was such a pleasure to work with throughout the process. I was so happy with their service and would recommend them to anyone getting married in the Tampa Bay area. Her team made the wedding so stress-free the month prior. They are extremely professional, quick with communicating, and really made the wedding day seamless. They created a timeline for the day of the wedding, and I can honestly say not a thing went wrong. Hiring a wedding planner was one of the best decisions I made for our wedding,” Sabrina gushed. 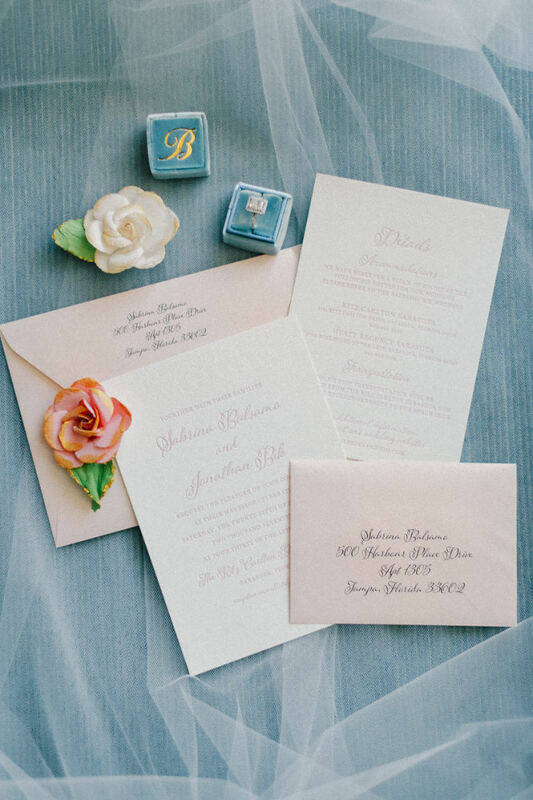 Keeping with their romantic wedding theme, the couple chose a beautiful off-white paper and hand-stamped blush letterpress wedding invitation by Tampa Bay wedding invitation designers A&P Designs. 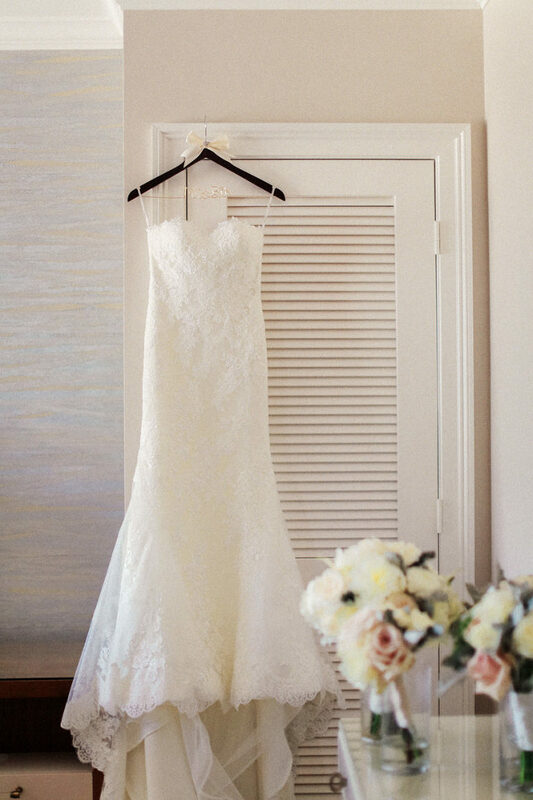 Looking back, one of the bride’s most cherished memories was the first look. “The most memorable moment was our first look. I am so happy we choose to do one and have some time alone before the ceremony to see each other. It helped make walking down the aisle a bit easier and our pictures turned out amazing since we had extra time to take them. Also, we were able to attend our cocktail hour and spend more time with our guests,” Sabrina reminisced. I wanted a romantic theme to go along with our wedding. I went with a beautiful off-white paper and blush letterpress and envelopes. I chose A&P Designs since they are a local business and were highly recommended to me by a few close friends. It was nice to be able to meet with the owner, Alicia, in-person to go over my vision for the invitations. She was great and knew exactly what I wanted. I was very happy with how they turned out. Jon surprised me with a trip to San Francisco and Napa Valley for my birthday. I found out where we were going that morning once we arrived to the airport. Jon is not much of a planner for vacations, so planning this on his own was very impressive since I am the planner. The proposal was at this beautiful park in Napa Valley right after we finished a bike tour, visiting a few wineries. I looked for someone who had experience with the venue, as well as style. I had a call with Nicole of NK Productions and knew she would be perfect; she was such a pleasure to work with throughout the process. I was so happy with their service and would recommend them to anyone getting married in the Tampa Bay area. Her team made the wedding so stress-free the month prior. They are extremely professional, quick with communicating, and really made the wedding day seamless. They created a timeline for the day of the wedding, and I can honestly say not a thing went wrong. Hiring a wedding planner was one of the best decisions I made for our wedding. We both wanted an intimate wedding with our closest friends and family. We did not go with an actual theme, but wanted it to be more of a romantic/elegant feel. 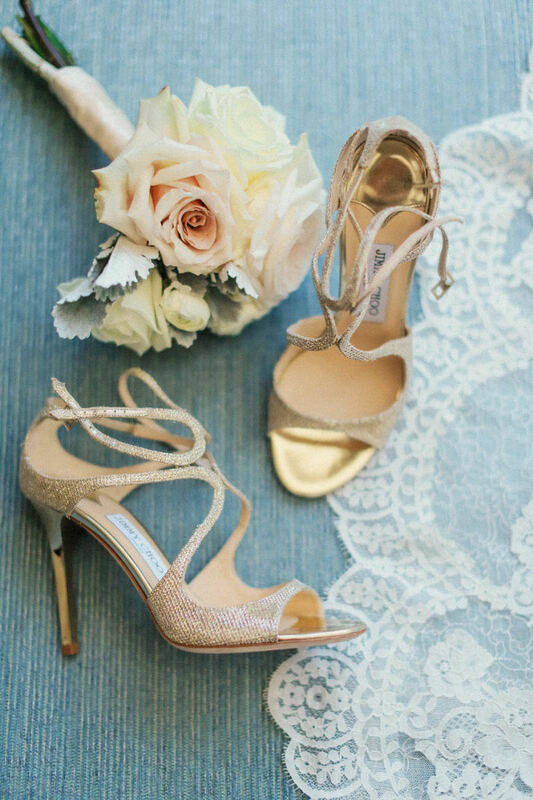 I love a light and neutral color palette, so went with gold, blush and whites for all our décor.